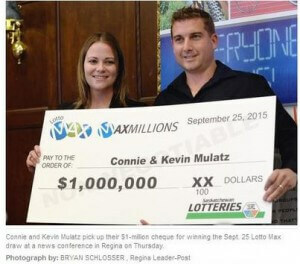 Kevin Mulatz and his wife Connie are lottery players who somehow manage to accumulate a lot of tickets before bothering to check the results. That was the case when Connie and one of their daughters went to a pharmacy to check a bunch of tickets; but this time one turned out to be a big winner. Mulatz thought it was a joke when they told him, but rushed over when he was finally convinced. The new millionaires now plan to pay off their mortgage, take their children to Disney World, and save for their children’s education.